For at least a year now, I have been searching for the perfect vampy red lipstick. Perfect meaning: looks just like the discontinued NARS Spanish Red, but is less drying and doesn’t go bad in a couple of years. I was pretty disappointed when NARS launched the Audacious Lipsticks and there wasn’t a dupe for Spanish Red to be found. So the search continues. 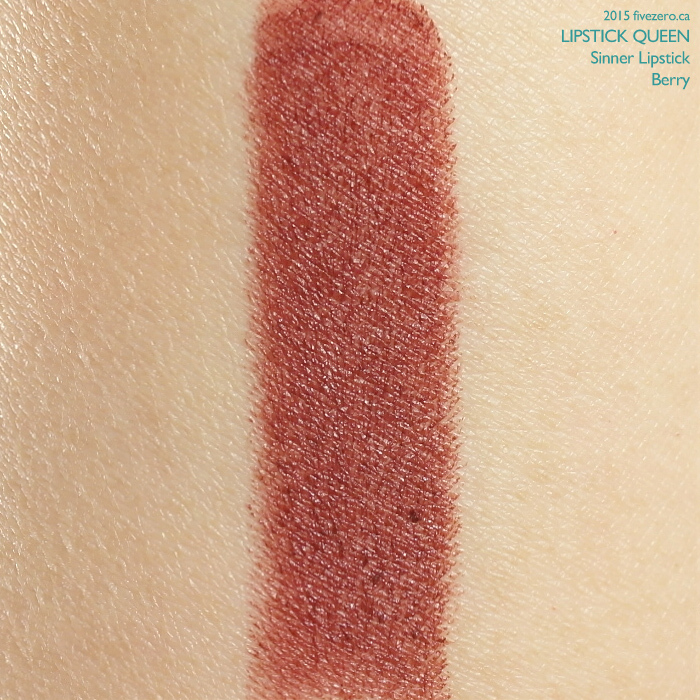 One of the first lipsticks I got in my search was Lipstick Queen’s Sinner Lipstick in Berry. The Sinner Lipsticks are simply their line of opaque lip colors; the Saint Lipsticks are sheer. Cute. I’d heard great things about LQ lipsicks, so I was very keen to try one. I ended up ordering it in the US and having it brought up to me here in Canada. The tube itself is pretty nice, but it has a rubberized texture which collects dirt and dust like nobody’s business. Arrrgh. Here it is in all its diseased-looking glory. I have used it a couple of times at this point, but the outside of the lipstick bullet basically looked like that when I first got it last year. It looks repulsive (actually, it looks worse in macro photos, but still). A quick Google told me that this was probably just wax crystallizing out of the lipstick, and there’s nothing unusable about it. OK. I mean, it doesn’t smell or anything, and it seems to work all right. But imagine if I’d ordered this as a gift for someone! ACK. What unholiness is going on with the surface of this lipstick?! Anyway, I doubt that this lipstick is bad, or fake, simply because I did order it from Nordstrom. So I will just say…EWWWWW. I have never bought such a yucky looking new product before, not even from a dollar store. Onto the lipstick itself. Berry (Sinner) is a gorgeous, deep rum raisin cream. It’s more browned than red, and a bit too plummy, so it isn’t quite what I am looking for. The color is a bit drastic on me, even for a vampy. It has a muted but seriously intense quality about it. I’d love to be able to wear this as a sheer stain, but no can do. Why? The texture is creamy, yet dry. It looks crumbly when I try to apply a sheer coat of it. It kind of works if I use a lot of lip balm first, but then it’ll just slide all over the place, so that won’t do. It’s opaque or nothing. You can, however, build up the darkness with additional coats. One coat is a nice, dark rum raisin, and additional coats get you silent film star lips. The pigmentation of this lipstick is incredible, but the texture is hard to work with. I suspect that this might work better using a lip brush, but I love applying from the tube. My swatch shows two coats. Additional coats get you the color in the tube. As you can see, two coats gives you an uneven texture, and more coats do not alleviate the problem. It just gets thicker and crumbier on the lips. Matte lipstick does not have to be like this. The lipstick has no fragrance or taste that I can tell. Honestly, I didn’t even have the patience to test out the longevity of this lipstick, because I don’t like the way it looks on me. Plus, it feels a bit thick and tacky on the lips. So, this lipstick was a massive fail for me. I’m not even sure what to do with the rest of it, since I have enough vampy options that I will never want to use this again. I guess I will probably give it one last try with a lip brush, one day, when I am less annoyed with it. I really hope I just got a bad one, because otherwise, I can’t understand all the raves for this brand’s lipsticks. 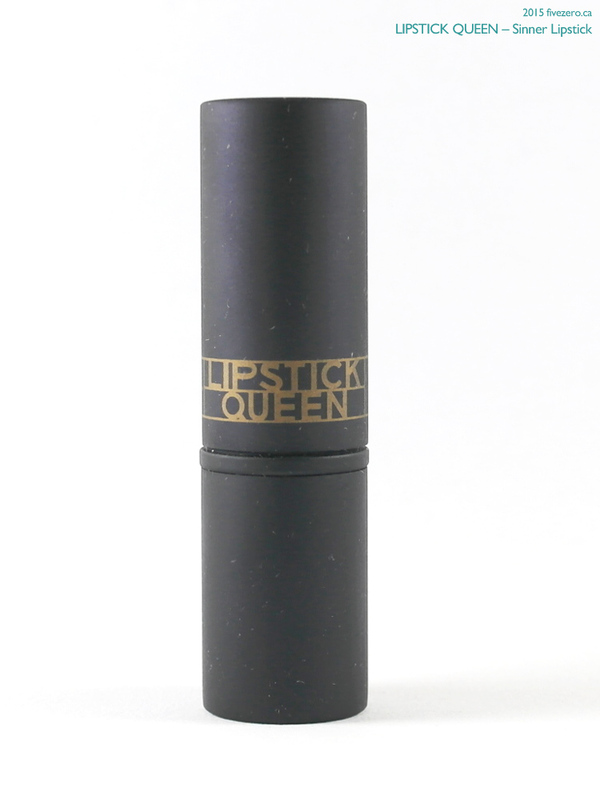 Lipstick Queen Sinner Lipstick is US$22 and 0.12 oz / 3.5 g. The lipstick I have is made in Canada. The brand is cruelty-free. 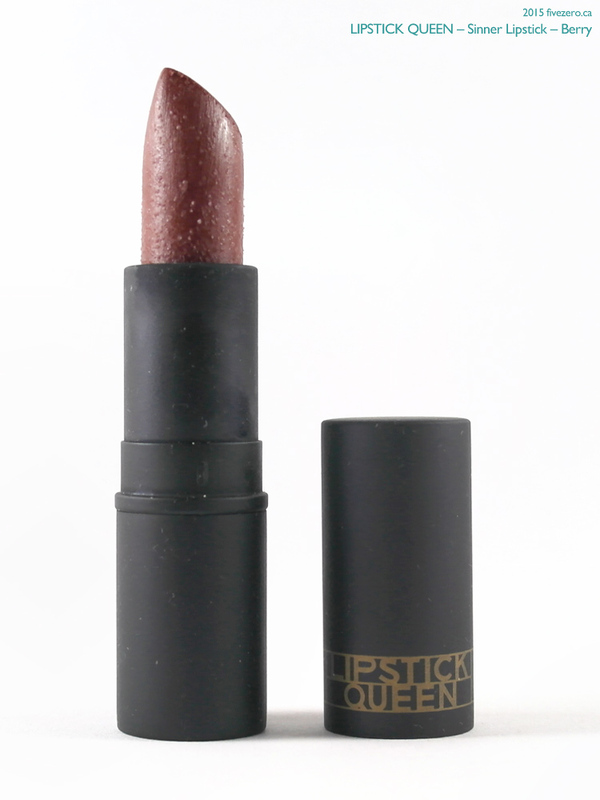 Lipstick Queen was founded in 2007 by Australian beauty entrepreneur Poppy King. In 2012, she sold the company to Space Brands Ltd. (who own Space NK in the UK). She maintains creative control at Lipstick Queen. OMG that bullet looks disgusting! Wow. I have read so many positives about this brand, I was thinking of trying to hunt down “Jean Queen” a while back. You know, that is a pretty good idea! I have about a million lip balms, so I’ll give one a try. Thanks! Ick! I can even tell by the swatch that I wouldn’t like the texture of this. Life is too short to wear bad lipstick! So sorry. Lipstick fails are the saddest of all the makup fails. Imagine if you have given this as a gift? That person might have thought it’s already expired or everything is just a pure joke. Anyways, somewhere between your rants I find my eyes glow.. I like brick toned reds! I just hope you’ll find something to work this out with. Still putting my hopes up. I am so glad I didn’t order this as a gift. Good grief. How awful that would have been. WHHAAAAT! Thats’s a scary looking lipstick with all of that weirdness happening on the surface! I only ever tried the Hello Sailor shade that I bought from Ulta, but will certainly never order online after seeing this! Eek! How did you like Hello Sailor? That sounds lovely, actually! tempted LOL! I hope you do post on it! I would love to read it.